Have you ever felt satisfied and dissatisfied at the same time? Relived but also in pain? Happy but also sad? 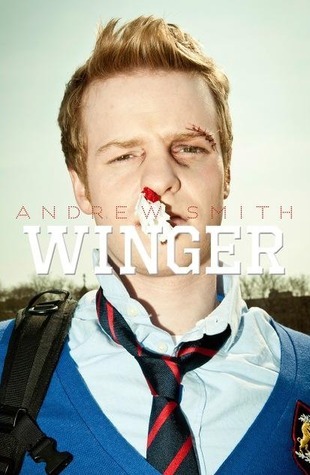 (I'm sounding more like one of those annoying commercials that sell stupid products) Well, being honest, I hate feeling like that, and Winger by Andrew Smith just made me feel like that... This is the third time I read a book by Andrew Smith (who I miss and admire for being a great person, teacher, and writer), and frankly, I was not expecting such emotional ride with Winger (maybe because The Marbury Lens was a totally different kind of book, and my head was not prepared for this). And I call it a ride because it really is a roller coaster of emotions. The story is not new at all. We have seen the picture of a scrawny kid trying to get his first girlfriend many times in books, movies, and even in music, but is Smith's humor and tenderness that makes Winger so refreshing. I never felt like reading a cliche story, or expecting the obvious. Everything I read of Winger felt unique, charming, and natural. Plus, there are some funny comic strips throughout the story (like Diary of a Wimpy Kid for teens). And there is also a variety of really good themes--from puberty to high school romance, and more. The book is also emotionally distinct, at least it was for me. Put it this way (and this reflection can be very personal): when you read a book about two lovers who are ill and about to die, you grieve because of discovering the suffering of the characters, but not because you are actually feeling their pain (unless, like them, you are also dying). Winger presents more average characters, with flaws and issues we are used to see; thus, it is easy for me to relate in a more personal way, not that I'm a high school Rugby player, but I'm also a skinny guy who falls in love once in a while, and who tries to be a better friend every day. So certain emotions were more vivid in me when I read the book. Again, this may vary depending on the mood or the things you are going through, but I truly cannot find any other explanation of why this book feels so emotionally different. I won't give spoilers, but I have to say that the ride becomes dark when you are not expecting; however, darkness comes with a good and fulfilling message about true friendship. Winger is a special coming-of-age that never drops its pace, humor, and kindness.